Summary: Everyone knows the legends about the cursed girl–Isabel, the one the señoras whisper about. They say she has green skin and grass for hair, and she feeds on the poisonous plants that fill her family’s Caribbean island garden. Some say she can grant wishes; some say her touch can kill. Review: “The house at the end of the street is full of bad air.” Look, I don’t know about you, but any book starts out with a sentence like that is one I have to read. The beginning, with its gorgeous language and vivid storytelling, had me hooked. A Fierce and Subtle Poison is told from the point-of-view of Lucas, who wiles away his summers in Old San Juan with flings, hanging out at the beach, and vaguely resenting his father, who everyone in the area knows as a developer who’s either saving the island, or ruining it. When his girlfriend disappears, his life ends up colliding with that of the magical Isabel, and the mysteries surrounding the house at the end of Calle Sol only grow. Lucas is believable as a teenage boy — to the point of frustration, at times. Throughout the book, Lucas remains buried in his romanticization of the girls around him and how grand his love is. I had to fight to not roll my eyes at several points. The women, both the central ones and those along the periphery, were far more fascinating. Nevertheless, I loved reading A Fierce and Subtle Poison on the strength of the beautiful language and magical realism alone. The story flourished, in spite of Lucas, solely on the writing itself. I wish there had been more time devoted to exploring the magical aspects of the story, which was more murder mystery focused, but that was not to be. Also, I’m a sucker for plants, and a story centered around a house with an incredible garden… um, yes please. 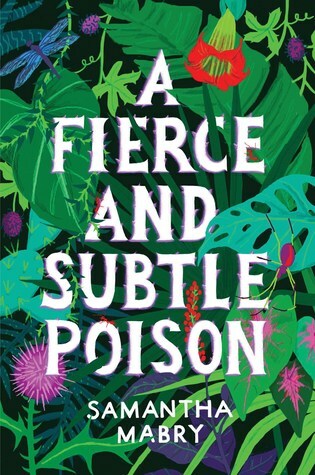 A Fierce and Subtle Poison is definitely worth a read. I’m looking forward to whatever Samantha Mabry writes next! tbh, I think it’s cool having a YA book from a teen boy POV. everybody else shames, says is cursed. I hope he finds out who she really is. whether she magic or not, that he still intrest in her. dont got be romance, they could jus be buddies. if that all they want. nice if girl end up w. lest 1 freind in village who not disappoint, hating on her. if I get this book from library, I hope things end happy for both charas!